Chapter 1: (9:18) Introduction Aloha! 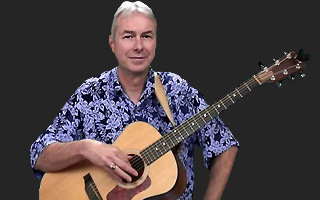 Welcome to the first lesson of Mark Nelson’s Hawaiian Slack Key Guitar series! Slack Key Guitar is an indigenous form of Hawaiian soul music. In this series, Mark will walk you through the basic techniques and tunings idiomatic to this style of play. Also, you will learn some interesting historical information regarding the origin of slack key guitar. Note: For more information regarding Mark and his career, check out his full biography. Slack Key isn’t the only genre that utilizes open tunings. American blues players from the southwest cultivated their own system of open tunings. Open E, and open D are tunings frequently used by blues guitarists. As Mark later explains, slack key is closely related to blues and country blues music. Open tunings have found their way into rock and roll as well. Rolling Stones guitarist Keith Richards exploits open G tuning to great effect. Open tunings allow for certain chord shapes and techniques that are not possible in standard tuning. Slack Key must be played fingerstyle. Bass and chord patterns are combined with soulful melody lines. The musical arrangement of the music necessitates the use of fingerstyle playing. For this reason, we recommend you check out the Phase 2 Fingerstyle lessons available on JamPlay. Studying these lessons in conjunction with this series will maximize your fingerstyle training. Don’t worry if you have no experience with these techniques. Mark will walk you slowly through the right hand mechanics necessary to play in this style. Mexican cowboys originally brought the guitar to Hawaii. Most historians speculate that this occurred around the middle of the nineteenth century. The Hawaiians referred to their visitors as “paniolo.” This Hawaiian word translates most closely to “Spaniards.” The Spaniards taught Hawaiians the basic fundamentals and techniques of their guitar style. From this point, the Hawaiians began to cultivate their own style. In the slack key style, traditional dance rhythms are combined with harmony native to the Hawaiian Islands. The primary focus of this lesson series is to develop guitar skills that are applicable to several genres. Studying the slack key style will hopefully open your eyes to an endless amount of new possibilities on the guitar. Mark, looks like its been awhile since you updated the lessons so don't know if youre still monitoring the comments but I wanted to thank you (and Jamplay) for introducing me to slack key. Ive just started the lessons and am enjoying them. Im looking forward to completing all that you have posted. Thanks again. Hi Mark, I was interested to know more about Slack Key and your introduction made me join. Hi,Mark,Enjoyed listning to your story.Joining your lessons. Aloha Mark I'm very excited to be studying with you....and I can appreciate your story. I have not found anyone else in my little town of Cambria that plays Ki ho'alu, an so....I've been teaching myself for about seven years. I guess you would say "that's learning the hard way". Hopefully I won't have to overcome too many bad habits. After visiting Kauai last summer and connecting with a friend who was learning to play, he told me that he was taking instruction with Jamplay and encouraged me to look into your program. So here I am. It's my Christmas present this year. What an opportunity!!! Glad you like the lessons. Lots of great players use thumbpicks and fingerpicks--check out Ledward Kaapana! The trick to getting your fingers to work is simple--practice. No worries, I've got lots of exercises in the series. Stay tuned! I just signed up for Jamplay about 2 months ago (I transfered from another online service). When I found out JP included Slack Key I was thrilled. I lived in Hawaii for a number of years and I love the music. I am looking forward to levelling up in order to begin the lessons. Thank you Mark for being willing to share this Hawaiian treasure, and thank you JP for including it in your line-up. You are by da kine! Glad to hear you are enjoying the lessons. Like they say, "Jes' Press!" That would be fun to go to the music camp. When are they? http://www.alohamusiccamp.com/ Looks like the next one isn't until February 2009! i just started but so far it looks good.mark doesn't get too far a head. this video was worth the price of my membership alone. Glad to hear it! There's plenty more coming! HI Mark, I had the chance to see you at Casanovas one sunday afternoon; wonderful; I am looking forward to sitting in on your lessons!! !